March 6, 2014, 4:03 PM · At one point during his technically astonishing performance of Waxman's "Carmen Fantasy" during the Junior Finals of the 2014 Menuhin Competition in Austin, the 14-year-old Japanese violinist Rennosuke Fukuda seemed to completely take over as leader of the orchestra. The tempo was his tempo, the music was his music, the spirit was his spirit. 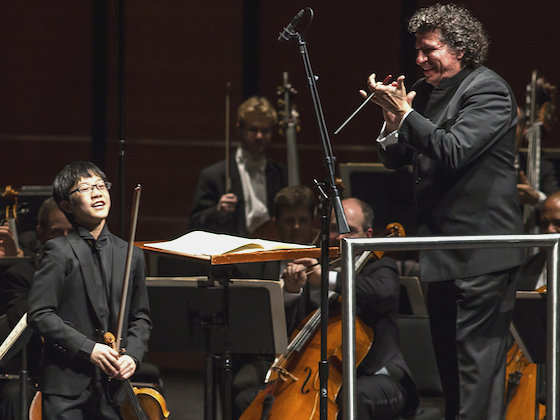 Thus I wasn't surprised to learn, when interviewing him backstage after he was named the First-Prize winner, that beyond his violin studies, Rennosuke aspires to be a conductor. Rennosuke does not speak English, so I interviewed him with the help of Tomoko Kashiwagi, who served as both his piano accompanist and his translator throughout the Menuhin Competition. "A conductor has the job of bringing everybody together, and to do that makes everybody happy," he said. "I want that kind of job." He has tried his hand at it, conducting for his public high school in Japan on occasion. What pieces would he most like to conduct? Without hesitation, he said he'd like to conduct Beethoven's Ninth Symphony. Beyond that, perhaps Beethoven's Fifth -- these are simply great pieces, he said. What was his favorite thing about the Menuhin Competition? "Playing the Carmen Fantasy by Waxman," he said -- the performance he had just given. It's a piece that he'd been preparing for two to three years, he said, and he loves it because of the way it feels: grand, tumultuous, full of tension. Rennosuke started playing the violin at age three, and he won his first violin award at age four. Even before he was born, "my mom already had the idea that if I was a boy, I would play the violin," he said. He studies violin with Machie Oguri, and most recently he won first prize and the "Virtuos" prize at the September 2013 15th Kloster Schöntal International Violin Competition in Germany. He also performed at the 2013 UNESCO charity concert in Paris for victims of the Great East Japan Earthquake. Do you like to practice? "I hate it!" he said, laughing. But the performing is another matter: "I try to enjoy the performance; I try not to think too much about it (as a competition)," he said. Some of his favorite violin pieces are the Bruch and the Tchaikovsky Concertos, he said. He looks up to a number of violinists, including Japanese violinists Mayuko Kamio and Daishin Kashimoto. He also likes to listen to the recordings of Perlman and Heifetz, and he likes recordings by Olivier Charlier, one of the judges for the competition. He said that he made a lot of friends at the Menuhin Competition. "Everybody is so good, I was really surprised," he said. He thought a lot about how to make his own unique character come forward and to enjoy the performance, he said, so he had fun with it. He also learned a lot from the other competitors; he particularly admired the sound of fellow finalist Daniel Lozakovitj, who placed second. "His sound is just so pretty," he said. He thought that some of the competitors that didn't advance from the first round were also technically very sound. Seeing the other competitors play gave him a lot to think about, he said. 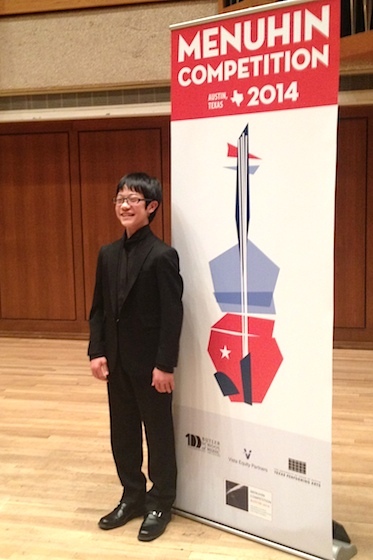 In case you missed them, here are some videos of Rennosuke's performances at the Menuhin Competition. Junior Final Round: Rennosuke Fukuda played Franz Waxman's "Carmen Fantasy" with the University of Texas Symphony Orchestra, conducted by Gerhardt Zimmerman. 4. Dan Welcher - "The Cowboy and the Rattlesnake"